The Global Volcanism Program has no activity reports for Stepovak Bay 3. The Global Volcanism Program has no Weekly Reports available for Stepovak Bay 3. The Global Volcanism Program has no Bulletin Reports available for Stepovak Bay 3. The Global Volcanism Program has no synonyms or subfeatures listed for Stepovak Bay 3. A group of four late-Pleistocene to Holocene volcanoes is located along a NE-trending line SW of Kupreanof volcano. Stepovak Bay 3 cinder cone, located 3.5 km to the NE of Stepovak 2 cone, has a thick Holocene lava flow that originated from an indistinct, ice-filled 300-m-wide crater and entered the same valley as the lava flow from Stepovak Bay 2 (Wilson, 1989). Elsewhere (in Wood and Kienle, 1990), Wilson noted uncertainty about Holocene activity from Stepovak Bay 3. Wilson F H, 1989. Geologic setting, petrology, and age of Pliocene to Holocene volcanoes of the Stepovak Bay Area, Western Alaska Peninsula. U S Geol Surv Bull, 1903: 84-95. Yount M E, Wilson F H, Miller J W, 1985. Newly discovered Holocene volcanic vents, Port Moller and Stepovak Bay quadrangles. In: Bartsch-Winkler S, Reed K M (eds), The United States Geological Survey in Alaska: Accomplishments in 1983, U S Geol Surv Circ, 945: 60-62. The Global Volcanism Program is not aware of any Holocene eruptions from Stepovak Bay 3. If this volcano has had large eruptions (VEI >= 4) prior to 10,000 years ago, information might be found on the Stepovak Bay 3 page in the LaMEVE (Large Magnitude Explosive Volcanic Eruptions) database, a part of the Volcano Global Risk Identification and Analysis Project (VOGRIPA). There is no Deformation History data available for Stepovak Bay 3. There is no Emissions History data available for Stepovak Bay 3. 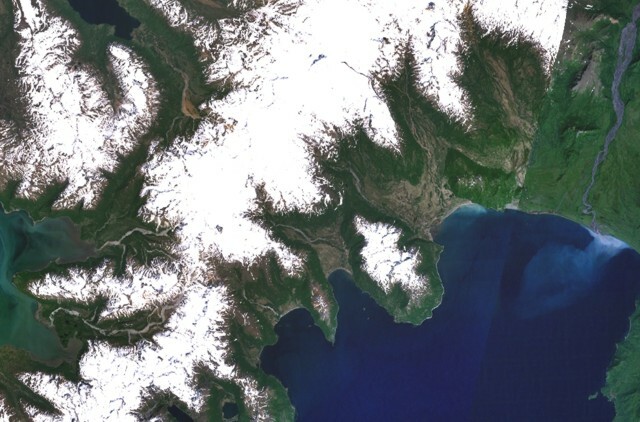 A group of four small late-Pleistocene to Holocene volcanoes referred to as Stepovak Bay 1 through 4 lies along the NE-trending snow-covered ridge extending from the top center to the lower left. The chain of volcanoes lies NW of Stepovak Bay (lower right); individual centers are not distinguishable because of the extensive snow cover in this NASA Landsat image (with north to the top). The larger Kupreanof stratovolcano lies out of view at the upper right. There are no samples for Stepovak Bay 3 in the Smithsonian's NMNH Department of Mineral Sciences Rock and Ore collection. Large Eruptions of Stepovak Bay 3 Information about large Quaternary eruptions (VEI >= 4) is cataloged in the Large Magnitude Explosive Volcanic Eruptions (LaMEVE) database of the Volcano Global Risk Identification and Analysis Project (VOGRIPA).